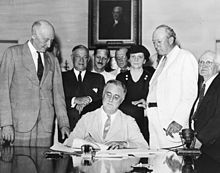 President Roosevelt signs the Social Security Act into law on August 14, 1935. The Social Security Act of 1935 is a law enacted by the 74th United States Congress and signed into law by President Franklin D. Roosevelt. The law created the Social Security program, establishing a basic right to a pension in old age, as well as insurance against unemployment. The law was part of Roosevelt's New Deal domestic program. By the 1930s, the United States was the lone modern industrial country without any national system of social security. In the midst of the Great Depression, physician Francis Townsend galvanized support behind a proposal to issue direct payments to the elderly. Responding to this movement, Roosevelt organized a committee led by Secretary of Labor Frances Perkins to develop a major social welfare program proposal. Roosevelt presented the plan in early 1935, and he signed the Social Security Act into law on August 14, 1935. The act was upheld by the Supreme Court in two major cases decided in 1937. The law established the Social Security program, an old-age pension program funded by payroll taxes. Over the ensuing decades, Social Security program contributed to a dramatic decline in poverty among the elderly, while spending on Social Security became a major part of the federal budget. The Social Security Act also established an unemployment insurance program administered by the states, as well as the Aid to Dependent Children program, which provided aid to families headed by single mothers. The law was later amended by acts such as the Social Security Amendments of 1965, which established two major healthcare programs, Medicare and Medicaid. Roosevelt signs the Social Security Act into law, August 14, 1935. Industrialization and the urbanization in the 20th Century created many new social problems, and transformed ideas of how society and the government should function together because of them. As industry expanded, cities grew quickly to keep up with demand for labor. Tenement houses were built quickly and poorly, cramming new migrants from farms and Southern and Eastern European immigrants into tight and unhealthy spaces. Work spaces were even more unsafe. By the 1930s, the United States was the lone modern industrial country where people faced the Depression without any national system of social security, though a handful of states had poorly-funded old-age insurance programs. The federal government had provided pensions to veterans in the aftermath of the Civil War and other wars, and some states had established voluntary old-age pension systems, but otherwise the United States had little experience with social insurance programs. For most American workers, retirement due to old age was not a realistic option. In the 1930s, physician Francis Townsend galvanized support for his pension proposal, which called for the federal government to issue direct $200-a-month payments to the elderly. Roosevelt was attracted to the general thinking behind Townsend's plan because it would provide for those no longer capable of working while at the same time stimulating demand in the economy and decreasing the supply of labor. In 1934, Roosevelt charged the Committee on Economic Security, chaired by Secretary of Labor Frances Perkins, with developing an old-age pension program, an unemployment insurance system, and a national health care program. The proposal for a national health care system was dropped, but the committee developed an unemployment insurance program largely administered by the states. The committee also developed an old-age plan that, at Roosevelt's insistence, would be funded by individual contributions from workers. In January 1935, Roosevelt proposed the Social Security Act, which he presented as a more practical alternative to the Townsend Plan. After a series of congressional hearings, the Social Security Act became law in August 1935. During the congressional debate over Social Security, the program was expanded to provide payments to widows and dependents of Social Security recipients. Job categories that were not covered by the act included workers in agricultural labor, domestic service, government employees, and many teachers, nurses, hospital employees, librarians, and social workers. The program was funded through a newly established a payroll tax which later became known as the Federal Insurance Contributions Act tax. Social Security taxes would be collected from employers by the states, with employers and employees contributing equally to the tax. Because the Social Security tax was regressive, and Social Security benefits were based on how much each individual had paid into the system, the program would not contribute to income redistribution in the way that some reformers, including Perkins, had hoped. In addition to creating the Social Security program, the Social Security Act also established a state-administered unemployment insurance system and the Aid to Dependent Children program, which provided aid to families headed by single mothers. Compared with the social security systems in western European countries, the Social Security Act of 1935 was rather conservative. But for the first time the federal government took responsibility for the economic security of the aged, the temporarily unemployed, dependent children and the handicapped. The Social Security Act has been amended significantly over time, but contains ten major titles. Title IV concerns Aid to Families with Dependent Children. Title V concerns Maternal and Child Welfare. Title X concerns support for blind people. Amendments of 1939: The original Act provided only retirement benefits, and only to the worker. The 1939 Amendments made a fundamental change in the Social Security program. The Amendments added two new categories of benefits: payments to the spouse and minor children of a retired worker (called dependents benefits) and survivors benefits paid to the family in the event of the premature death of the worker. The 1939 Amendments also increased benefit amounts and accelerated the start of monthly benefit payments from 1940 to 1942. These amendments raised benefits for the first time and placed the program on the road to the virtually universal coverage it has today. Specifically it is the introduction of the cost-of-living adjustment (COLA). In the 1930s, the Supreme Court struck down many pieces of Roosevelt's New Deal legislation, including the Railroad Retirement Act. The Court threw out a centerpiece of the New Deal, the National Industrial Recovery Act, the Agricultural Adjustment Act, and New York State's minimum-wage law. President Roosevelt responded with an attempt to pack the court via the Judicial Procedures Reform Bill of 1937. On February 5, 1937, he sent a special message to Congress proposing legislation granting the President new powers to add additional judges to all federal courts whenever there were sitting judges age 70 or older who refused to retire. The practical effect of this proposal was that the President would get to appoint six new Justices to the Supreme Court (and 44 judges to lower federal courts), thus instantly tipping the political balance on the Court dramatically in his favor. The debate on this proposal lasted over six months. Beginning with a set of decisions in March, April, and May 1937 (including the Social Security Act cases), the Court would sustain a series of New Deal legislation. Chief Justice Charles Evans Hughes played a leading role in defeating the court-packing by rushing these pieces of New Deal legislation through and ensuring that the court's majority would uphold it. Two Supreme Court rulings affirmed the constitutionality of the Social Security Act. Steward Machine Company v. Davis, 301 U.S, 548 (1937) held, in a 5–4 decision, that, given the exigencies of the Great Depression, "[It] is too late today for the argument to be heard with tolerance that in a crisis so extreme the use of the moneys of the nation to relieve the unemployed and their dependents is a use for any purpose narrower than the promotion of the general welfare". The arguments opposed to the Social Security Act (articulated by justices Butler, McReynolds, and Sutherland in their opinions) were that the social security act went beyond the powers that were granted to the federal government in the Constitution. They argued that, by imposing a tax on employers that could be avoided only by contributing to a state unemployment-compensation fund, the federal government was essentially forcing each state to establish an unemployment-compensation fund that would meet its criteria, and that the federal government had no power to enact such a program. Helvering v. Davis, 301 U.S. 619 (1937), decided on the same day as Steward, upheld the program because "The proceeds of both [employee and employer] taxes are to be paid into the Treasury like internal-revenue taxes generally, and are not earmarked in any way". That is, the Social Security Tax was constitutional as a mere exercise of Congress's general taxation powers. Flemming v. Nestor, 363 US 603 (1960) upholding §1104, allowing Congress to itself amend and revise the schedule of benefits. Further, however, recipients of benefits had no contractual rights to them. Goldberg v. Kelly 397 US 254 (1970) William Brennan, Jr. held there must be an evidentiary hearing before a recipient can be deprived of government benefits under the due process clause of the Fourteenth Amendment. Weinberger v. Wiesenfeld (1975) held that a male widower should be entitled to his deceased wife's benefit just as a female widow was entitled to a deceased husband's, under the equal protection and due process clauses of the Fourteenth Amendment. In 1940, Social Security benefits paid totaled $35 million. These rose to $961 million in 1950, $11.2 billion in 1960, $31.9 billion in 1970, $120.5 billion in 1980, and $247.8 billion in 1990 (all figures in nominal dollars, not adjusted for inflation). In 2004, $492 billion of benefits were paid to 47.5 million beneficiaries. In 2009, nearly 51 million Americans received $650 billion in Social Security benefits. During the 1950s, over-65s continued to have the highest poverty rate of any age group in the US with the largest percentage of the nation's wealth concentrated in the hands of Americans under 35. By 2010, this figure had dramatically reversed itself with the largest percentage of wealth being in the hands of Americans aged 55–75 and those under 45 being among the poorest. Elder poverty, once a normal sight, had thus become rare by the 21st century. Reflecting the continuing importance of the Social Security Act, biographer Kenneth S. Davis described the Social Security Act "the most important single piece of social legislation in all American history." ^ "History 1930". Social Security Administration. Retrieved May 21, 2009. ^ Butler, Chris. ""The Social Impact of Industrialization," The Flow of History". Flow of History. Retrieved October 24, 2016. ^ Kennedy 1999, p. 260. ^ McJimsey 2000, p. 105. ^ Kennedy 1999, p. 261. ^ McJimsey 2000, pp. 105–107. ^ Kennedy 1999, pp. 257–258, 371. ^ Kennedy 1999, pp. 262–266. ^ Kennedy 1999, pp. 270–271. ^ McJimsey 2000, p. 108. ^ Quadagno, Jill (1994). The Color of Welfare: How Racism Undermined the War on Poverty. New York: Oxford University Press. p. 7. ^ McJimsey 2000, p. 107. ^ Kennedy 1999, pp. 267–269. ^ Kennedy 1999, pp. 271–272. ^ Mary Beth Norton; et al. (2009). A People and a Nation: A History of the United States. Since 1865. Cengage. p. 670. ISBN 0547175604. ^ Achene, Andrew (1986). Social Security Visions and Revisions. New York: Cambridge University Press. p. 25-6. ^ "Social Security Administration". Ssa.gov. Retrieved September 11, 2011. ^ www.historycooperative.org  Archived March 9, 2012, at the Wayback Machine. Historycooperative.org. Retrieved on 2013-08-12. ^ a b c d e f g McKenna, Marian C. (2002). Franklin Roosevelt and the Great Constitutional War: The Court-packing Crisis of 1937. New York, NY: Fordham University Press. ISBN 978-0-8232-2154-7. ^ "Steward Machine Company vs. Davis, 301 U.S, 548". Archived from the original on November 28, 2005. Retrieved December 3, 2005. ^ Kennedy 1999, p. 273. This page was last edited on 25 April 2019, at 02:16 (UTC).